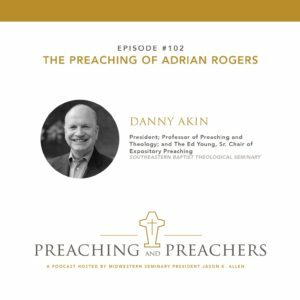 This week on Preaching and Preachers, Dr. Danny Akin joins me in a discussion on the preaching of Adrian Rogers. Dr. Akin serves as Professor of Preaching and Theology, the Ed Young, Sr. Chair of Expository Preaching, as well as the President of Southeastern Baptist Theological Seminary in Wake Forrest, North Carolina.